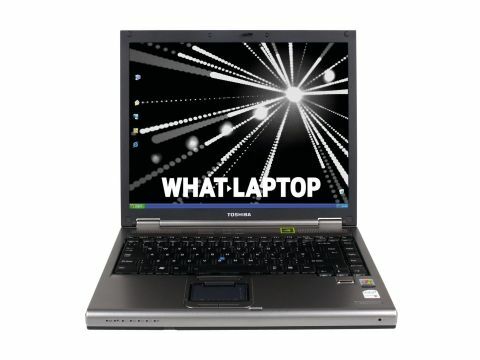 The Toshiba Tecra M5 (£1056 inc. VAT) targets the business user. As such, it comes with Windows XP Professional Edition, a fingerprint reader for added security, and a 4:3 aspect ratio screen. The 1024 x 768 pixel screen (XGA) measures 14.1-inches, and does without a glossy Super-TFT coating. While colours lack vibrancy somewhat, the Toshiba's screen is less reflective than some. Supporting the display is an nVidia Quadro NVS 110M graphics card. This is a high-end workstation chip, intended for CAD (Computer Aided Design) and colour matching, and offers 256MB of memory. Running presentations or multimedia tasks does not pose a problem, which is highlighted in the 3DMark 2003 score of 3331. The Toshiba's square shape allows plenty of room for a palm rest, making the Tecra a comfortable machine to use. The corners of the laptop are curved, and the chassis is finished in gunmetal grey. Build quality is good - the Toshiba has a rigid chassis constructed from sturdy and resilient materials. Although lagging slightly behind the Lenovo X60 in terms of robustness, it's easily capable of withstanding life on the road. Unfortunately, the keyboard doesn't feel so strong, flexing under the slightest pressure. However, the keys are well spaced and a decent amount of travel enables typing at speed. A responsive pointing stick is placed in the middle of the keyboard, and a traditional touchpad lies further down the chassis. Powering the Toshiba is an Intel Core Duo T2300 processor, running at 1.66GHz. With 512MB of DDR2 memory, the M5 managed a MobileMark 2005 score of 211. We found it to be an effective machine, running several applications simultaneously without lag. The 40GB standard hard drive is small, compromising what is otherwise a reasonable package. A portable 2.3kg weight enables the user to take advantage of the 200-minute battery life. Befitting its status as a business machine, the Toshiba features Gigabit Ethernet, enabling you to join fixed networks. Wireless networks can be set up using an 802.11a/b/g Wi-Fi adapter, and connectivity is boosted by the inclusion of Bluetooth. You'll also find VGA and S-Video sockets, to connect external monitors, projectors or televisions. Usability is diminished by the lack of a DVD rewriter - the M5 is the only machine in this group to feature a CD rewriter/DVD ROM as standard.